Having selected the candidates – which we talked about last time – then come the interviews. And, these can now be “behaviorally smart”, using questions based on the outcomes of the pre-hire assessments you’ve completed. Well-structured resumes are not difficult to produce, with or without a professional writer. We also know that performing well at an interview might fall into the category of acting out a role. So, with the cost of a bad hire reckoned by some in the recruitment industry to be in the region of $240,000 per employee including salary, onboarding and training, getting the interview process right is crucial. Historically, many times people are employed for their skills and knowledge and little or no attention is paid to identifying candidate’s true talents. Natural behaviors which continually and predictably repeat themselves over time and are often not easily seen in an interview. Armed with the pre-hire assessment natural discovery outcomes, the interviewer is equipped to question candidates in a way that targets the behaviors hidden below the surface, now revealed through the discovery process. This makes behavioral questioning at the interview stage even more important. Clearly, it’s key at the interview stage for interviewers to be aware of their own blind-spots. Without this insight, it could form part of the failure to uncover the natural behaviors of the candidates. Both interviewer and candidate will have “learned” to operate a certain way, not necessarily in line with who they naturally are. Potentially, over time, and with pressure the natural behavior would emerge, and the candidate could well not be performing the way that was hoped and the interviewer might miss critical issues that need to be addressed with the candidate. A key first step in pre-hire assessment and the behavioral interviewing process, is to understand what skills, talents and behaviors are already present in the business. This exercise reveals the gaps both in talents, behaviors and communication styles that need to be filled as part of the ongoing success of the business. To avoid hiring based on empathy felt toward any particular candidate and moving away from the traditional interviewing style (“tell us about…”), behaviorally smart recruiters question candidates in ways that necessitating responses with stories about how, having faced a challenge or event in the past, they dealt with it. What they learned from the experience and how? With hindsight, how they would have done things differently? Taking this conversational approach – informed and focused via your pre-hire assessment?- will reveal behaviors, communication styles, problem-solving skills and business maturity. That means better fit for role, team and culture, and, hopefully, longevity. How often as leaders have you heard these comments or observed the parallel behaviors? I’m not trained to do that. It’s just a job for me. I’m not passionate about what I do. There is nothing more frustrating to people than to be asked to do a job they a) can’t do b) don’t want to do or c) are not passionate about. For years, I did what I was asked to do. I was good at it, but not passionate about it. Then one day I was asked my opinion about a service issue, not knowing who I was speaking too (my bad, it was the CEO who I’d never met. There were 70,000 employees, so forgive my ignorance), I answered confidently with my solution. A month later I was called to serve on a senior think tank as they worked and strategized to implement my suggestion. Suddenly I was fulfilling my passion. I Was Doing What I Am. Communicating both verbally and in writing. Taking the message to the world. Years later, I got to know why I was so passionate and successful with my work. I completed a Business DNA Natural Behavior Discovery assessment and was given detailed insight into the core of who I am. Suddenly everything lined up. I knew that trying to be successful outside my uniqueness would only bring heartache. But I also learnt what a powerful asset I am to an organization, and that alone increased my confidence. I didn’t just get to understand my hardwiring in terms of my talents. I also now know that I’m very focused, and prefer to operate alone; private, serious, and reserved; and would rather socialize with close associates than with strangers. So, you can imagine, I needed to learn how to work in a team. And having these DNA insights meant I could figure out how to do that. I also got to understand the importance of reigning in my spontaneity – born I’m sure out of my passion for what I do. This insight is just a tiny part of what the Business DNA Natural Behavior Discovery revealed to me. The phrase, often used by career specialists, do what you love is outdated. 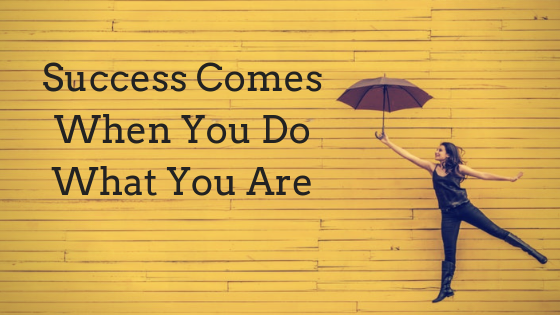 Instead of focusing on doing what you love, do what you are, based on understanding your unique talents. When leaders get to recognize that behaviors — caused by unmanaged human differences, pressure and emotions — derail performance, then they can guide their people to achieve greater self-empowerment so that they make behaviorally smart decisions, accelerating their performance to live a quality life with meaning, delivering the results the business needs. Here’s is a link to complete your own Business DNA Natural Behavior Discovery. When a consultant is engaged to resolve a business challenge, invariably they begin the process with a meeting to uncover the issues. One huge pain point for consultants is getting to the bottom of specific problems. Being able to analyze what is being said about the issues to deliver solutions can be tricky. It doesn’t matter what level of the organization is briefing you, care must be taken to apply a behavioral and communication filter to what is being said. Regardless of the briefing – most skilled consultants would agree that a very large percentage of business challenges is people-related. As a consultant, this is fertile ground for you. Regardless of your expertise in any given field, being able to analyze behaviors is a key selling point. A unique point of differentiation that actually pays dividends. From the C-suite to the front line – all behaviors and communication styles should be known. 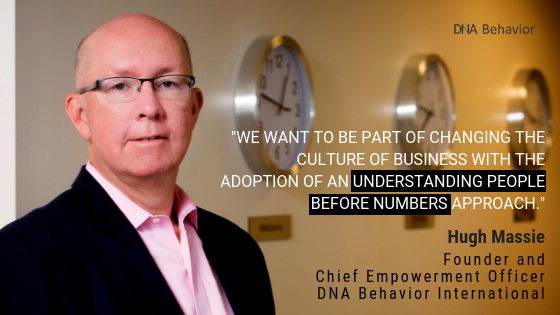 Since 2001, DNA Behavior has used validated behavioral insights to guide businesses building a stronger people culture. The Natural Discovery process reveals practical information on how best to manage behavioral differences. 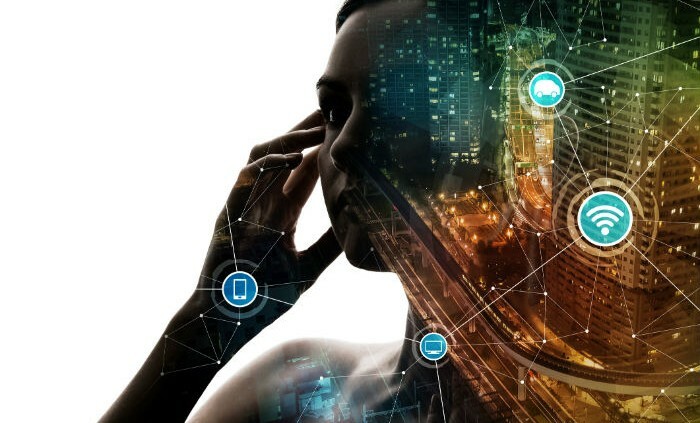 By delivering customized experiences for management, their employees and customers, you will be positioned to resolve wide-ranging challenges your clients might be facing. 2002 Harvard Research shows 87% of business issues are communication-related – caused by human behavioral differences. If coaches, management consultants and others are to provide companies with solutions they need to dig below the surface, they’re going to need ways to find out individual behaviors, including whether, or not, people are emotionally invested in the company. At DNA Behavior International we have recognized over the past 20 years the importance of understanding #PeopleBeforeNumbers. Using scientifically based data gathering, we know that even the most difficult of business issues are rooted in individual behaviors. Not surprisingly, many CEOs find people issues a challenge. They feel, quite rightly, that dealing with the people takes their mind off the strategy and direction of the business. And, the day-to-day pressure of business can surface many challenges, not because of incompetency, necessarily, but because the norm has become mundane and people behave differently when bored or unfulfilled. Consultants are in a highly competitive market place. There is plenty of work available for quality consultancies and this means there is significantly higher competitiveness. Again, you need a point of differentiation and DNA Behavior International can provide you with that unique insight and edge. DNA Behavior can provide you the consultant with solutions that bring a fresh perspective and a breadth of experience to companies you work with. Why not take 10 minutes to complete your own DNA Behavior Natural Discovery. Whatever you offer in the way of consulting – we partner with you to enhance the people part. Sounds too good to be true? Why not try it? Complimentary, on us. You’ll appreciate the difference and so will your clients. Consultancies exist in many shapes and sizes. Whether you give strategic advice, solve crises, help increase efficiency or provide other solutions, when you can reveal individual behaviors and talents your service offering increases exponentially, enabling you to provide more focused and more quantifiable perspectives and solutions. We offer scientifically-based Natural Discovery tools that enable you to know, engage and grow your clients and their staff at a deep level. We train you to interpret and use the Business DNA Natural Behavior Discovery Reports to improve Personal Talent, Hiring and Team Performance. And, to make that first meeting pitching your work more impactful. We deliver tools and insights enabling you to work with clients to improve the Hiring Process and Conduct Behavioral Interviews. Working with groups – got that covered. You will be able to build team performance through a greater understanding of personal and team member motivations. You will know how to work with leaders to interpret and use the Business DNA Leadership Performance Report and guide a leader to build a Leadership Performance Plan. You get access to Communication DNA Discovery Reports to increase the emotional engagement of employees and customers for relationship performance. You will be able to offer services to Diagnose Business Engagement Strengths and Struggles through Behavioral Insights for improving Business Planning. Here’s a personal invitation from our CEO/Founder to partner with us to build your business.